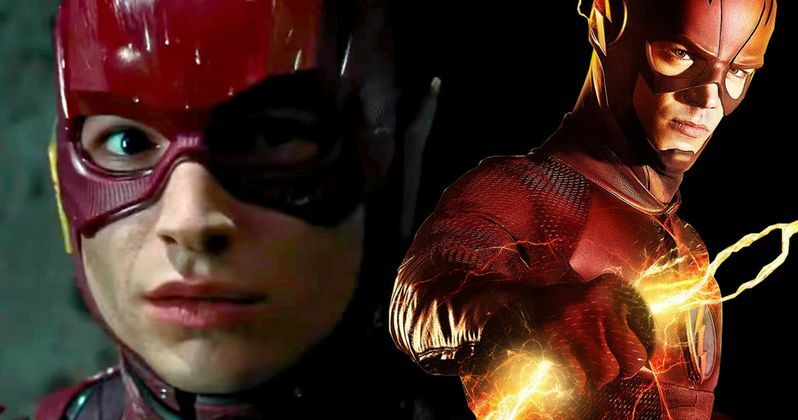 Will The Flash Movie Crossover with the TV Show? Ever since Warner Bros. started crafting their DC Extended Universe (DCEU) for the big screen, some fans have been disappointed that the movie side won't be connected to the burgeoning DC TV universe. The biggest opportunity for any sort of crossover is with The Flash, which has Ezra Miller starring as the movie version of Barry Allen and Grant Gustin heading into his third season as the speedster on The CW series of the same name. During a recent interview, Ezra Miller teased that there may be some sort of crossover between both Barrys after all. You may recall that, earlier this year, Grant Gustin took to social media to ask his fans to stop "bashing" Ezra Miller, stating that he "fully supports" his casting. However, this May, The Flash TV series star Tom Cavanaugh dissed Zack Snyder for overlooking Grant Gustin as the movie version of The Flash. During a recent interview with MTV, Ezra Miller teased that both of these Barry Allen's may end up meeting at some point. Here's what he had to say about Grant Gustin. "He's a boss. I can't wait to see him, eye to eye, adrift in the Speed Force - our eyes will lock and, in that moment, we will both know the truth. What truth? I dare not say." Of course, it's possible that Ezra Miller is only joking about "meeting" this other Barry Allen in the Speed Force, but then again, it's also possible that Warner Bros. has changed their mind about connecting the movie universe with the TV universe. After all, their first two DCEU films, Batman v Superman: Dawn of Justice and last weekend's Suicide Squad were both torn to shreds by critics, so perhaps the studio is now considering crossing the TV world into the movie world. While Ezra Miller wouldn't expand on those comments, he did talk about working with director Rick Famuyiwa. "I think there's just an intention to make something extremely fun and something superhuman and something deeply human. It's the thing we're all trying to do, but I think Rick's mind and his heart are in an excellent place, and his expertise as a filmmaker, as evidenced by Dope, all come together as very exciting factors to me. It's hard when talking about Rick to not use the word dope too many times. It's the Brooklyn in me; dope is a big part of my vernacular." Warner Bros. announced at their Hall H Comic-Con panel that Kiersey Clemons, who starred in Rick Famuyiwa's Dope and this summer's comedy sequel Neighbors 2: Sorority Rising, has come aboard to play Iris West in this new superhero adventure. Ezra Miller wouldn't say much about his new co-star, but he did reveal that they had an incredible chemistry read together. Here's what he had to say below. "Kiersey is amazing. I had the opportunity to read with her and do some explorative acting in our chemistry read ... the results of these experiments clearly were positive. I'm just deeply excited about what these people carry in their hearts, and I'm excited about the radical intention that everybody seems to be bringing to the genesis chamber of this film." Back in April, a new report revealed that Iris West is one of five DC Comics characters who are currently being cast, along with Eobard Thawne, Fred Chyre, Len Snart and Jay Garrick. We don't know for sure when these roles will be filled, or when exactly production will begin, but Ezra Miller teased one of his biggest influences in researching The Flash, comic book legend Grant Morrison. Here's what he had to say about his interactions with Grant Morrison. "Grant Morrison is my absolute Guruji when it comes to The Flash and the mythos of the comic book - these two-dimensional realities that we engage with in our three-dimensional world. Us trying to understand those beings is as ludicrous as those two-dimensional beings trying to understand us, and yet there's something about The Flash that we can relate to on a uniquely human level." Back in April, producer Deborah Snyder teased that Cyborg (Ray Fisher) will be featured in The Flash movie. The movie hits theaters on March 16, 2018, just a few months after Justice League arrives on November 17, 2017. It isn't known if any other members of the Justice League will be dropping by in The Flash, but we'll be sure to keep you posted with more updates as soon as we have them.